In 2000, when Notre Dame wide receiver David Givens, his star play maker, was crying after the second game of the year, Urban Meyer inquired as to why? It turns out that Givens said that he was crying because he wanted to help his team win, but couldn’t because he didn’t get the ball at all during the game. Notre Dame was ranked fifth overall and lost to number one ranked Nebraska in overtime. Urban realized that something had to change. You can not go an entire game and never put the ball in your play makers hands. Urban’s mind started churning! Urban was then working at Notre Dame with Lou Holtz, but had higher aspirations. He wanted to be a head coach one day and spent most of his time taking notes and planning to be a head coach. This habit started back at Ohio State when he was a graduate assistant with Earle Bruce and continues till today. That’s when the idea of the Spread Option Offense was born. Urban, then the special teams coach at Notre Dame, and his friend Dan Mullen, a graduate assistant at the time, decided to travel the country, take notes, and find a way to get the ball to their play makers. They spent the previous spring with the offensive coordinator for John L. Smith, Scott Linehan, who in Louisville, was blowing the doors off defenses with their spread formation offense. The former quarterback from Idaho, working under Dennis Erickson at Idaho, was the genius behind this new powerful spread attack and was excited to share his ideas with Meyer and Mullen. 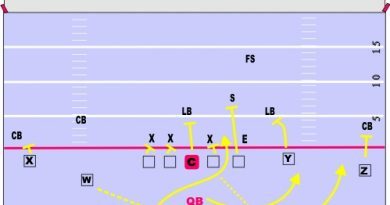 Meyer then turned to Kevin Wilson, the offensive coordinator at Northwestern under the late Randy Walker, where he and Mullen learned about zone option reads and how to optimize the spread attack. They further began to study Joe Tiller’s passing attack at Purdue as well, which has also broken offensive records. Drew Brees played there in that system. Early parts of the Spread began to show up in Notre Dame’s offense in 2000, but was very cryptic and simple. Meyer still hadn’t figured it all out. Initially, they would line up in a spread formation and run a quarterback or running back draw or just hit seam routes. It hadn’t evolved or become the spread option that we know today. It resembled a West Coast Offense, but was still in its infancy. Finally, Urban Meyer was hired as head coach of Bowling Green State University and he used this little school in the Mid American Conference as his offensive laboratory. He implemented an all new offense that was 100% his own new offensive strategy. This little experiment would draw national attention as they wiped out opponents. Bowling Green went on to become the first MAC school to beat three BCS teams in one season, set offensive records, was ranked as high as 20th in the nation and 16th the following year, as well as open many people’s eyes to this “new gimmicky offense” that they were running. They averaged 40 points per game (3rd in the nation) and started out 8-0, when they hadn’t won more than six games the past 2 seasons. They went on to win 17 games in his two years there. The Spread would continue to evolve as he had discussions with Rich Rodriguez of West Virginia who also ran a similar type of offense until it finally became the Spread Option. They key to the Spread Option has always been adapting it to your personnel and players. Rodriguez’s spread was a run-first offense, which Meyer preferred. Urban Meyer moved on to Utah, where he and Alex Smith went on to break numerous offensive records in an undefeated season and then to Florida where he and Chris Leak won a national championship. All this time he continued to develop and enhance his Spread Option offense. At Utah, they went undefeated, scored 46 points per game and racked up 520 yards per game. Yes, PER GAME! Impressed? The New England Patriots, using a variation of Urban Meyer’s spread offense broke every NFL scoring record in 2007. Bill Belicheck and his offensive coordinator, Josh McDaniels, would travel to Florida in the summers to pick Urban Meyer’s brains. Impressed? How can this simple offensive strategy yield so much offense, and why hasn’t anyone else thought of this? So what is the Spread Option Offense? Urban would go on to coach special teams himself, realizing that the kicking game is one third of football, and since most teams don’t practice it too often, he can gain a serious advantage here. So, now what is the Spread Option Offense? The Spread is about match ups. Remember David Givens? How can we get our speedy play makers the ball? The spread is about getting the ball thrown, handed off, pitched, or snapped to speedy offensive play makers, in space, to let them work their magic. Urban always says that if you have the better athletes, you can win with any type of offense. Eddie George won in the I-formation. You have to have the best talent. After that, it doesn’t really matter what offense you run. Urban Meyer thinks that if a coach says he doesn’t have the players to run his offense, then the coach needs to be fired. How many times do you hear a coach say, “I don’t have a West Coast quarterback, so I can’t run my offense.” Coaches need to adapt to their talent. Something Meyer did well with Alex Smith at Utah and Leak at Florida. It wasn’t until Tebow started that the Spread Option was in full gear (the way Harris used to run it in it’s infancy at Bowling Green). The Spread Option Offense is about an offensive versus defensive numbers game. Similar to a basketball fast break, except Meyer adds a read option. If the quarterback reads the option correctly, the offense is always right! The offense should always outnumber or match the defense in the numbers game. The Spread wants to use the entire field. Make the defense defend all 53 yards of width and 100 yards of length. The spread wants to even out the numbers. If the quarterback can run, you have 11 offensive players against 11 defensive players. If the quarterback can’t run, then you are down to 10 offensive players versus 11 defensive players. If the quarterback hands off to a running back, you are down to 9 versus 11, because neither the QB nor RB can be involved in blocking for the ball carrier. The Spread is an offensive philosophy. It is not a formation. It is not a collection of plays. It’s not a playbook. Everyone has plays and playbooks. It’s about implementation of an entirely new thought process and new approach to football which tries to showcase the play makers. It’s a process, not a collection of plays. The Spread tries to equate numbers. You never hand the ball off to an offensive player unless everyone is blocked or out of the play. It all starts with the quarterback in shotgun reading the defense. Is it “one-high” or “two-high?” One safety or two? Or no safeties? Meyer’s spread also likes to count defenders in terms of “plus” or “minus.” If the offense has one more blocker than the defense has players, you are “plus one.” If you have six defenders in a certain area, you have to make sure you have an equal number of blockers. Pretty easy? The Spread always starts out from a shotgun formation. Hence, you always read one defender and you do not block him. You always have to have a “hat on a hat”, or a blocker on all the defenders. The quarterback has to read the off-side defensive end or linebacker, who goes unblocked at the point of attack, and then the quarterback simply runs the option play. Easy enough? The problem for defenders is that they try to cover everyone and can’t. If the defensive end comes flying around the corner towards the running back, the ball is given to the running back to go up the middle and all defenders are blocked. 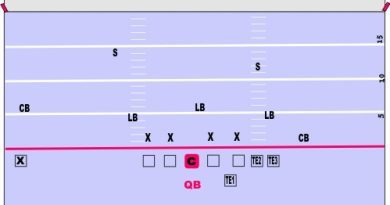 If the defensive end stays home or goes inside to stop the run up the middle, the quarterback has an option to run to the sideline and take it up field himself, option the ball to the receiver running the option with him or find an open wide receiver down field for a pass. The offense is always right! So what if a defense decides to have no safeties and put everyone in the box? This gives the offense a “plus one” or one man advantage, and the pass goes to the open wide receiver. Because the receiver can always blow by his man, he is considered uncovered. Can the defense really cover five speedy offensive player, whether they be running backs, wide receivers or tight ends? If all four defensive backs are in man coverage, will they really be able to cover? Not at the high school level, not in college, and not even in the NFL. And if they try to cover 5 receivers, will they tackle a runner up the middle? Just run it. So if there is no high deep safety, the quarterback should hit the deep ball and score an easy touchdown. 1. One high: Equal numbers, you can run the ball and be OK. You are equal. 2. Two high: You are plus one. Run the ball, because they outnumber you in the passing game. They can double your receivers. 3. No deep: Can you run the ball (meaning just a hand off)? No, they took the extra defender and put him in the box. Now there are two answers: You run option, or you throw it. And if you throw it, you better have a better receiver out there than their defensive back (and that’s usually the case). The offense is always right and should always outnumber the defense. The idea is to run these plays and this philosophy in succession and drive defenses crazy. That is the Spread Option Offense. How you draw up the plays, the blocking assignments, and the formations doesn’t really matter. Meyer’s Spread is able to run the same exact play out of multiple formations. Whereas other spread attacks run multiple plays from the same exact formation. Meyer’s Spread is unique in that you can do both. At the end of the day it boils down to the fact that the players on the offensive side of the ball are better, faster, stronger athletes and should always win the numbers game. At all levels of football, the offensive players are better skilled and faster. You should always have an advantage. Unless you play recreational football, where everyone plays both ways. If you ask Urban Meyer if this is really just the Wing T offense rehashed, he will say that it is the Wing T offense to a “T” (pun intended). But obviously, a playbook is simply a collection of plays, whereas the Spread Option Offense is an entire philosophy and strategy. A lot of college teams began emulating and copying Meyer’s Spread. Texas won a national championship with it, LSU has started using it, Vanderbilt, Tennessee, and Auburn have all begun copying Meyer’s plays. A lot of teams winning bowl games were using elements of Meyer’s Spread. If you watch Meyer’s teams in action and understand his philosophy, Meyer’s offense is a run-first offense. After reading the defense, most of the time you run the ball, whether that is up the middle or on an option. They avoid throwing unless the defense allows it. Other places where a type of spread attack is used, they pass first, pass second, pass third. Hawaii loves to pass. West Virginia loves to pass. Appalachian State loves to pass. Further proof, when Tim Tebow won the Heisman he rushed for 22 touchdowns and passed for 29, a total of 51 touchdowns. They were very run heavy. Meyer will always run first, run second, run third, if given the option. 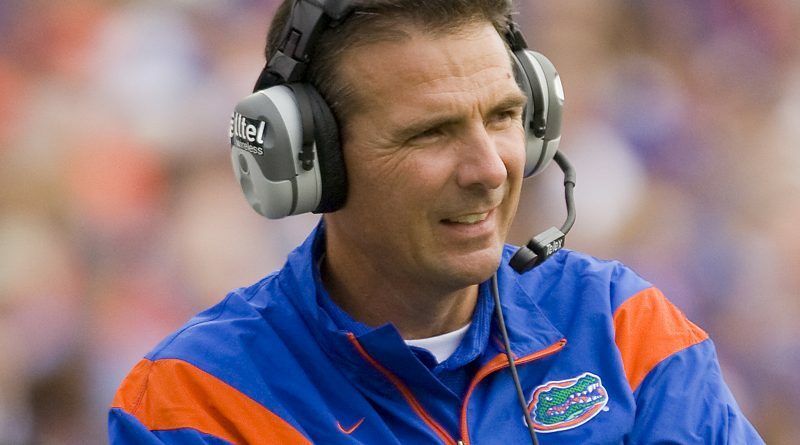 After the New England Patriots 2004 season, coach Bill Belicheck and offensive coordinator Josh McDaniels went to Gainesville, Florida to meet with Urban Meyer, scout some of his offensive players and discuss the spread option with him. Over the next few years, they would form a great bond and change the New England Patriots offensive attack from an old, smash-mouth, Earhardt-Perkins offense left over from the Charlie Weiss and Bill Parcells era, to a new spread attack. The rest is history! The 2007 New England Patriots went on to break every offensive NFL record with this new spread attack. They grew tired of stumbling into super bowls and barely winning them by three points. They wanted the offense to be explosive and be able to dictate to the defense. If you watch their offense, they use multiple formations to run the same plays, similar to Meyer’s spread. The exception is that the NFL quarterback can’t run. At least, not yet. Wel,, at least not Tom Brady. It will be interesting to see how coach Josh McDaniels implements his offense in Denver. With all the new offensive weapons (great wide receivers, great tight ends, great full back and running back), the best pass-blocking offensive line in all of football, and Kyle Orton at the helm (played in Purdue’s spread offense), Josh will have every opportunity to continue the spread offense he began in New England. See updates below. Of course, in the NFL, the quarterback doesn’t usually run, so you are always playing 10 versus 11. But this may change with the new “wildcat” that the Miami Dolphins have adopted. They also went on to draft Pat White, who ran the West Virginia spread offense with coach Rich Rodriguez. It will be interesting to see what they decide to do with their new talents. A lot of other NFL teams have dabbled with this. We saw Denver try to do something similar with Tim Tebow. They did go on to win 11 games, make the playoffs, beat Big Ben in over time in the playoffs, to then lose to New England. We have added a number of Spread Offense plays and have even uploaded Urban Meyer’s playbook to our playbook section. Take a look and enjoy using this simple spread attack. Under Josh McDaniels, Kyle Orton was on pace to breaking Dan Marino’s passing record until he got injured. Eventually, Tebow would get to start and McDaniels would be fired after a cheating and videotaping scandal. Josh McDaniels had drafted Tim Tebow, the quarterback that ran Meyer’s Spread Option Offense and was hoping to bring more of the spread to the NFL with a running quarterback that was big and durable. That would even out the numbers game to 11 on 11 football in the NFL, which wasn’t possible previously with Orton. Tim Tebow may very well be the greatest “option” or wildcat quarterback the NFL has seen and it will be interesting to see what he will do in the NFL with the Broncos adapting to his style of offense. In the 2011 game at San Diego, Tebow had 22 rush attempts, setting the single game NFL record. It will be fun to watch Tebow implement more of the spread in the NFL. It’s nice to see that the coaching staff is willing to adapt and adjust and win games. John Fox, Denver’s head coach said during the off season that he was planning on implementing the most advanced running game that the NFL had ever seen. Maybe we are seeing that now with Tebow and McGahee. Kyle Orton had his two best career statistical years under Josh McDaniels. In 2009, he threw for 3800 yards (career best). In 2010, he was on pace to throw for over 5000 yards, but was injured and missed the last 3 games. Still his two best years in the NFL. Josh McDaniels was then fired.